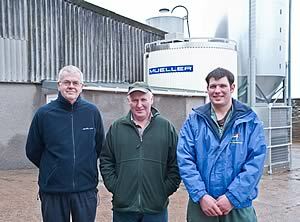 The installation of a new milk silo has provided numerous financial benefits for Robin Bell and his son Richard at Moorland Close, Eaglesfield, Cockermouth. The old 5,000 litre Mueller DX tank had served the farm well but with yields running at 10,500 litres for the 135 pedigree Holstein milkers the Bells wanted to move to every other day collection and save money with a more energy efficient system. “Just on the increased milk price and energy saving alone the silo’s net price after taking into account the sale of the old tank will easily pay for itself within three to four years. To me that’s an excellent return,” said Robin. “We wanted to keep to Mueller tanks because our old one had been so reliable,” said Robin. 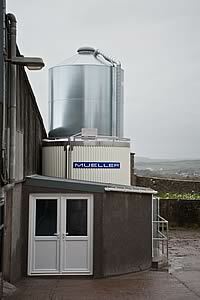 “Many of the DX tanks were put in in the 1990s when producers were moving to every other day collection and it is a credit to Mueller that they can cope with the extra milk. “Our local agent GD & M Dunglinson at Brunstock, Carlisle, was promoting outdoor silos which was attractive to us as we would have had to carry out major alterations to accommodate a bigger tank. “While the silo was more expensive we didn’t even consider the cost of the building work for an indoor tank once we had seen some installations and we were looking for a more efficient system incorporating a heat recovery unit,” said Robin. The silo has fitted neatly in between a small addition to the dairy building to give covered access to the stainless steel alcove housing the cooling and cleaning controls and an existing feed hopper. The Bells opted for a 15,000 litre silo with M3 control along with a Mueller Freheater which heats up the water for parlour washing, cutting down on energy. The energy saving element of the installation, which is expected to cut a minimum of £1,000 a year off the farm energy bill, attracted a grant from the North West Livestock Programme. Increasing the tank’s capacity has allowed the milk to be sold to Meadow Foods from the beginning of the year on an every other day collection, earning a premium of 0.4ppl on the current 1.5 million litres sold annually. The Bells re-stocked after losing their herd in 2001’s foot and mouth epidemic and replaced the commercial black and whites with high genetic pedigree Holsteins to concentrate on dairying while beef and sheep had also been run previously on the Bell’s 248 acres 160 of which is tenanted from Queen’s College, Oxford, and the remainder owner-occupied. Their Paddle herd in 2010 was the leading herd on production in the National Milk Records for Cumberland and Lancashire. “The herd’s production has remained pretty steady since re-stocking but the new silo gives us the option to increase herd numbers from the current 160 to more than 200 and we have to think about the future,” said Richard. The herd is now closed and with numbers currently static up to 20 surplus calved heifers are sold each year at the Border and Lakeland Club sales at Carlisle and through Cockermouth Mart. Covered access to the silo with the cooling and cleaning controls. The silo’s highly efficient cooling system means that the milk is cooled to the optimum 3.5 degrees by the finish of milking. Previously the old tank was still cooling the milk up to two hours after the end of milking. The M3 washing system takes about half an hour to clean the silo. The silo has fitted neatly in between a small addition to the dairy building to give covered access to the stainless steel alcove housing the cooling and cleaning controls and an existing feed hopper. 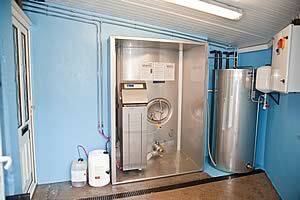 “With the silo being outside it also saves time washing the outside of the tank when it got dusty. I think when the dairy inspector sees this she will be over the moon,” said Robin. Malcolm Douglas, manager of GD & M Dunglinson, Mueller distributors for the North of England and Scotland, said: “The Mueller Fre-Heater recovers wasted heat from the milk cooler's refrigeration units to heat water up to 50-55degC which can then be transferred to existing plant and tank water heaters to substantially reduce water heating costs and improving your profitability – which is important in today’s economic climate. * Moorland Close was the birthplace of Fletcher Christian in 1764, famous for leading the mutiny on the Bounty following its breadfruit expedition to Tahiti in April 1789. The story has been the subject of numerous movies which included stars Errol Flynn, Clark Gable, Marlon Brando and Mel Gibson, the latter having visited the farm.